Its a balmy, rainy day here in El Paso and I find myself enjoying the weather with a Henry Clay Rustic Cheroot and a Parish/Answer Our Cake is a Lie. 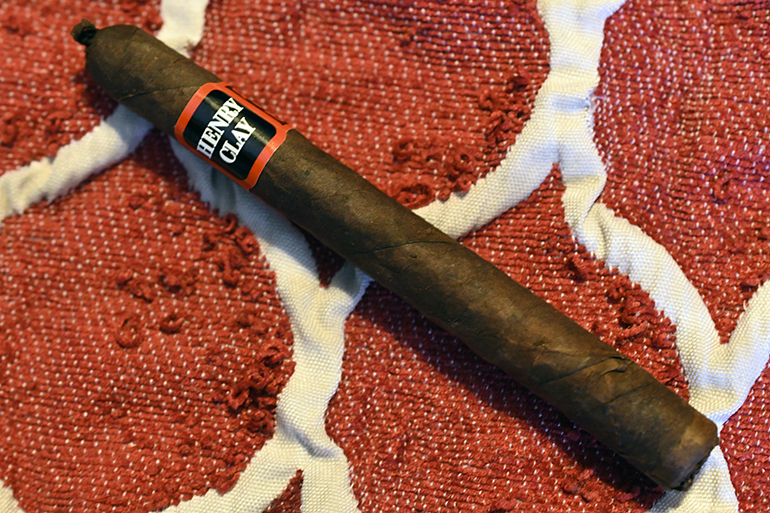 The Henry Clay Rustic Cheroot is one of the newest of the Henry Clay Blends to hit the market early last year. Offered in only one single size (5 5/8 x 38) the new blend is created using a Connecticut Broadleaf wrapper, Honduran binder, and special Dominican fillers that a selected to create a bolder experience as well is pay homage to cigars that are smoked years ago by tobacco workers in the field as they’s sneak into the barns and create small cigars to smoke on the job using various fillers from pilons in the barns. This is why the cigar looks the way it does which makes sense once you reach the “Prelight” section of this review. Big Thanks to out friends at Cuenca Cigars for sending a few of these our way. The Henry Clay Rustic Cheroot isn’t the best looking cigar, and I think Rustic is definitely the term here. The cigar’s wrapper looks a bit beaten, as its sloppily laid over itself revealing lots of inconstancies in the seams. The color is a splotchy mess of orange, medium, and dark brown. The wrapper’s texture is extremely toothy and gritty while it feels very thick and heavy. 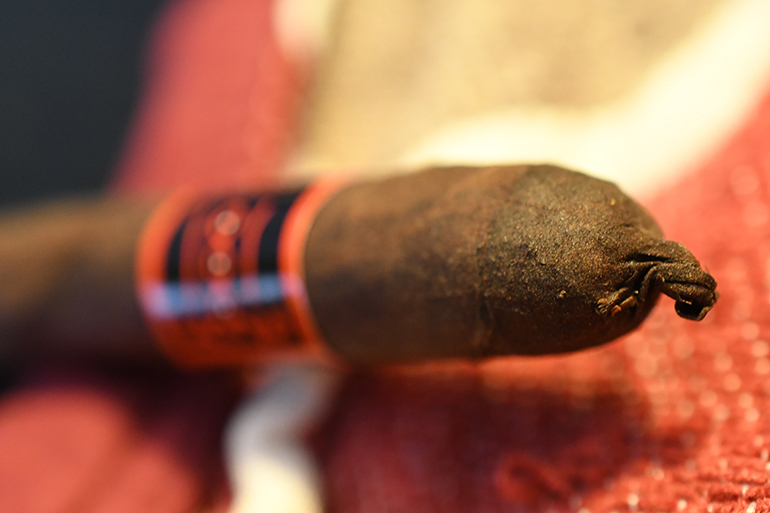 There are quite a few bumps and veins located throughout the cigar’s body leading up to the round, tailed cap. 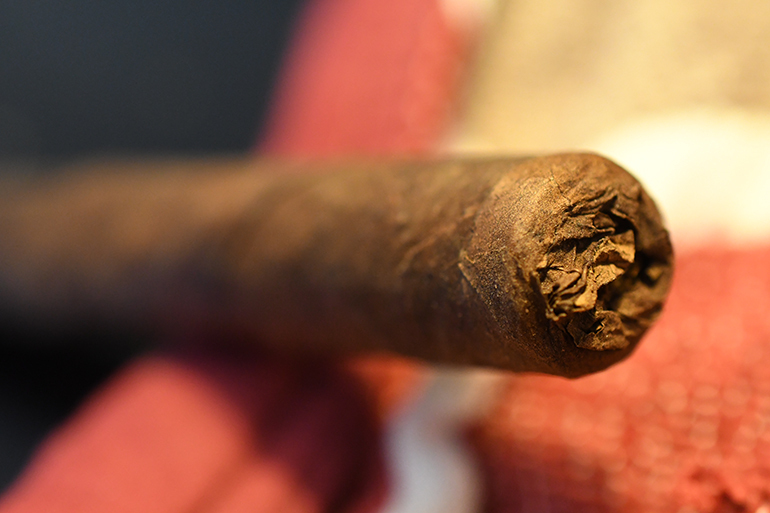 The cigar also features a wrapped foot where the wrapper tobacco used is quite a few shades lighter than the rest of the wrapper on this particular cigar. 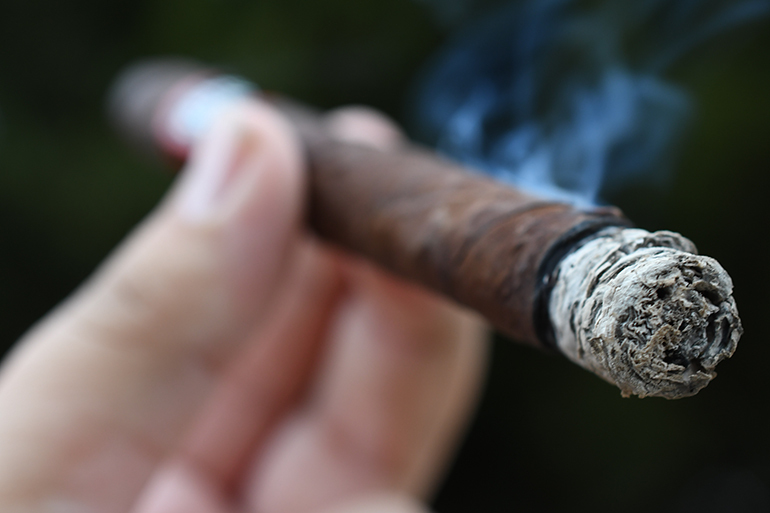 The cigar feels hard in some areas, soft in others, and bumpy in others. The wrapper gives off some great sweet chocolate and spice aromas while the foot has a much more natural tobacco/earthiness aromas to it. The cap cut clean and easily using my Xikar XO double bladed cutter. The cold draw showcases some great spices, ginger, chocolate and natural tobacco. 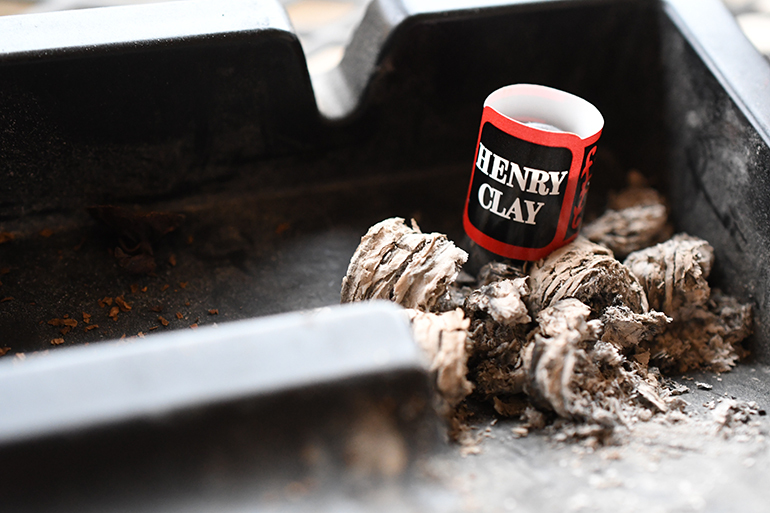 The Henry Clay Rustic Cheroot starts out with a surprisingly large bang of black and cayenne pepper which hangs around for the first few puffs before drawing back allowing the cigar to showcase some great dark chocolate, ginger, cinnamon, and natural tobacco flavors. The draw is absolutely perfect. Every little puff kicks out a great amount of thick, gray smoke while the cigar releases absolutely no stationary smoke as it rests in my ashtray. The burn line is razor thin and dead even leaving behind a trail of tightly compacted white and light gray ash which held on for about 3/4 of a inch before falling into my ashtray. 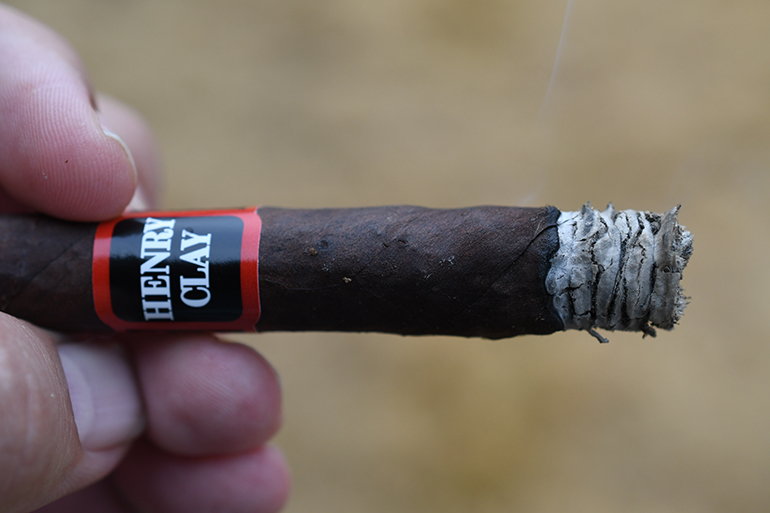 Into the second third of the Henry Clay Rustic Cheroot and the flavors have remained the same, only they have creamed out a bit more coming together in a smoother more balanced profile. The Chocolate and cinnamon still lead the charge with notes of ginger, natural tobacco, and some soft cedar. The retrohale brings more of the spice to the front of the smoke. The cigar is still burning perfectly and I close out the second third with not signs of nicotine. Into the final Third and the flavors remain identical to the second. Lots of dark chocolate and cinnamon, cedar, natural tobacco, and ginger. This cigar took me a total of an hour and a half to smoke down to the nub which is impressive as I expected it to burn much quicker. I experience no harshness, nor extended heat as I close out the final third with only a minor nicotine kick. Outside of having to relight the cigar once, the burn and experience was flawless from start to finish. This is a classic example of not judging a book by its cover. This is a terrible looking cigar which delivered a winning experience on all counts. The flavor profile isn’t very complex, but it doesn’t need to be. This is a great cigar to just sit back, relax, and not have to put too much thought in. With the extremely affordable price tag this is something that will easily find it’s way into my everyday rotation. 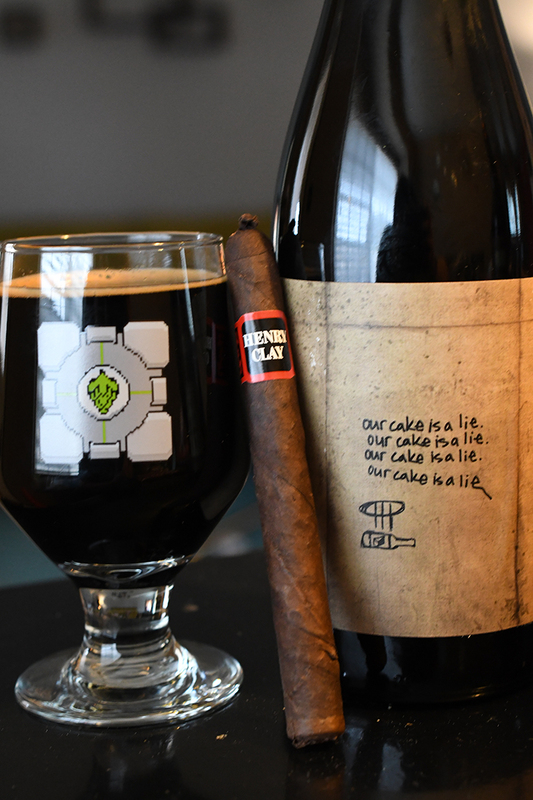 I decided to pair this Henry Clay Rustic Chroot with a bottle of Our Cake is a lie which is a Portal-themed imperial stout brewed in collaboration with the Answer and Parish. The beer leads with tons of heavy sweetness, brown sugar, cinnamon, chocolate, and hints of coconut, malt, and almond with a very heavy mouthfeel before finishing even sweeter with straight-up chocolate cake flavors. 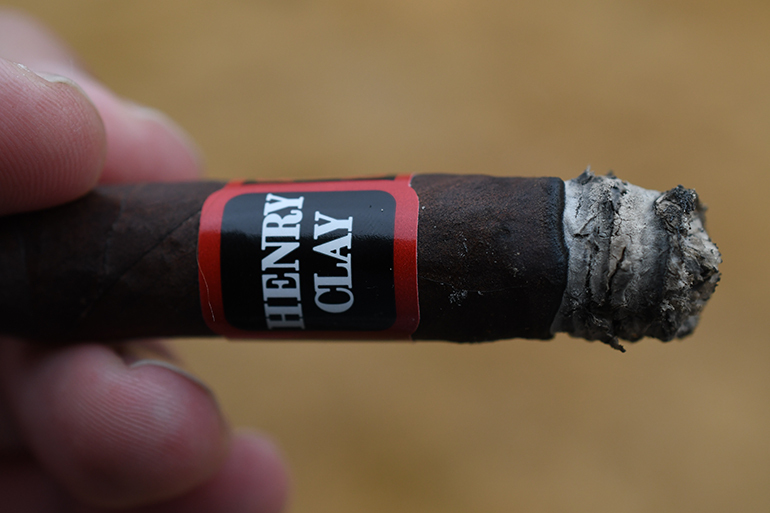 The chocolate, sweetness, and cinnamon married out wonderfully with the flavors in the Henry Clay while the overwhelming sweetness helped bring the sweetness out of the cigar. I like the ” rough” looking cigar every so often. Sound likes this a good tasting, bad looking cigar. This smoke brings to mind a quip that a former roomie of mine said about his step-father’s dog: “It’s so ugly, it’s cute”. This is a great smoke, made even better by its price. Definitely worth having a ton of these on hand.